The common name of the field ant comes from its preference for nesting outdoors. The field ant is the largest genus of ants found north of Mexico. 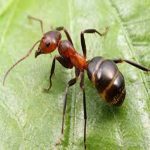 Field ants are also known by many other names such as thatching ants, red ants and wood ants. Field ants primarily feed on honeydew, which is a substance from plant-sucking insects such as aphids, mealy-bugs, and scale insects found on trees and shrubs. However, some species of ants, including the silky ant, gather groups of aphids so there is always a vast supply of honeydew. Other types of field ants are scavengers and are attracted to meats. These ants construct mounds made up of plant materials, such as grass, twigs, leaves and pine needles. They often nest around small trees, shrubs or rocks where other species build their nests in the cracks of sidewalks, along foundation walls and at the base of trees. Field ants rarely nest in homes but occasionally enter in search of sweets. Although they do not have a stinger, they will bite when disturbed. They will spray formic acid into the wound when they bite, so it can be very painful. Since field ants often avoid entering houses, low-level populations do not need to be treated. However, a thorough inspection is necessary if they become a nuisance in the yard.